Have you ever wanted to make a really cool log or a piece of jewelry with a wood grain looking finish? I’ve put together a really quick tutorial on how to make a faux wood grain using polymer clay. 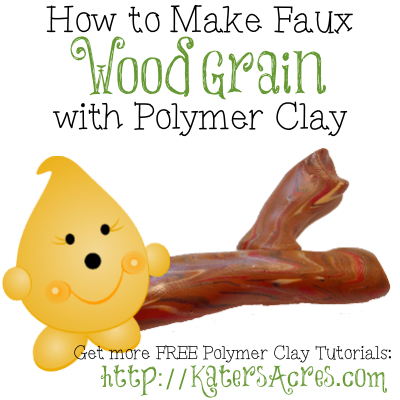 Please know that there are many ways to make faux wood grain with polymer clay. This is the way that I make faux wood grain to use in my sculptures. Without further ado, enjoy this free polymer clay wood grain tutorial. Your choice of polymer clay in brown, red, bronze, tan, and “wood” colors. First thing is first: gather your polymer clay tid-bits. NOTE: When I make faux wood, I usually grab clay scraps from my scrap bowl. Condition all your clay pieces. Roll each piece of clay into a snake and lay alongside each other. Begin to twist the snake and continue twisting and rolling, twisting and rolling, until a fair amount of blending is seen and there are no more stripes (picture of snake being coiled and blended in bottom left). Roll the ball into a snake to form your wood pieces. NOTE: If the marbling on the outside of your clay is not enough, do not forget to cut your clay open and see the “wood grain” on the inside. Or you can use the snake and roll it through the pasta machine to make a streaked wood laminate piece. That’s it! Easy peasy and oodles of fun. Make sure to subscribe to get more FREE tutorials in your email. This is so cool!! Definitely will be giving this a try with the kiddos soon.